Celebrating the 2018 face-off in Russia, adidas reaches into the archives and brings back exact replicas of kits worn by celebrated teams in the '90s. 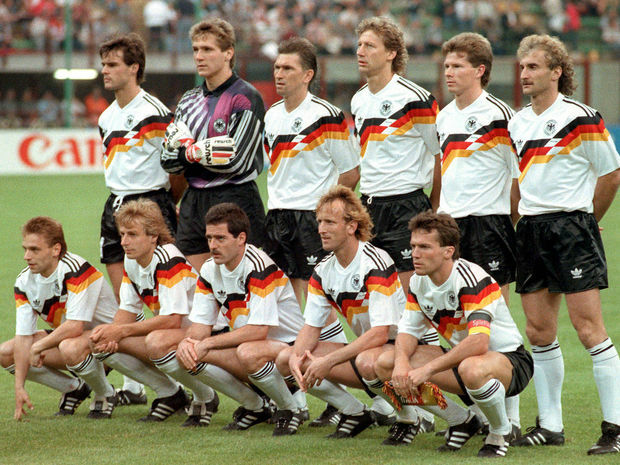 This Germany Jersey is an authentic replica of the 1990 adidas jersey worn by Germany, right down to the last stitch. Made of a comfy knit blend, the jersey boasts the country's colours and is decorated with the original crest, 3-Stripes on the shoulders and an oversize "10" on the back. were those stripes that big in 1990? You had one job Adidas, to simply replicate what you did in 1990. And somehow you managed to fail. LOOK AT THOSE GIANT STRIPES !? !